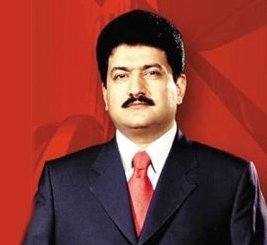 Geo New Famous Journalist Hamid Mir which is exposed recently after coming of an Audio Tape in which he is shown talking with a Punjabi Taliban Leader. in the Audio Tape he is also talking against Former ISI officer Khalid Khawaja that was killed by Punjabi Taliban. Now son of Khaild Khawaja has announced to go to court against Hamid Mir and said that Hamid Mir has connections with Anti Pakistan elements and Enemy agencies. But do you remember who was the first person to Expose Hamid Mir one year ago??? it was Zaid Hamid who exposed Hamid Mir first of all and that video is still on Youtube. in that Video Zaid Hamid said that Hamid Mir has connections with Anti Pakistani elements and Foreign agencies and his task is to spread disinformation about Pakistan. That predication of Zaid Hamid is proved truth after coming of this Secret Audio Tape.